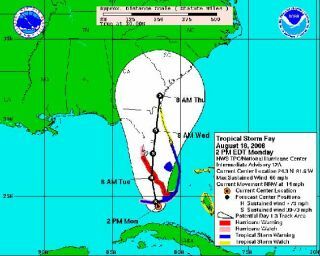 This graphic from the U.S. National Hurricane Center depicts the anticipated three-day course of Tropical Storm Fay as of Aug. 18, 2008. NASA?sspace shuttle Atlantis will have to wait a few more days before leaving itsFlorida spaceport hangar in order to avoid severe weather expected fromTropical Storm Fay. The shuttlewas slated to make the short trek from its service hangar to NASA?s cavernousVehicle Assembly Building at the Kennedy Space Center in Cape Canaveral, Fla., onMonday, but mission managers opted to wait until Fay passed before moving the100-ton spacecraft into position to receive its fuel tank and twin solid rocketboosters. ?It?s saferright now to leave it in the [Orbiter Processing Facility],? NASA spokespersonCandrea Thomas told SPACE.com. ?We want to make sure everything is safe.? Thomas saidthe main concerns included high winds and rain associated with Fay, which wasmoving northeast toward the southwestern coast of Florida at about 14 mph (23kph) with sustained maximum winds nearing speeds of 60 mph (95 kph), accordingto the National Hurricane Center. Atlantiswill likely not make the move to the Vehicle Assembly Building until aboutmidday Thursday, but the delay should not impact the shuttle?s plannedOct. 8 launch toward the Hubble Space Telescope, Thomas said. ?Right now,there?s no impact on the targeted launch date,? she added. Commandedby veteran spaceflyer Scott Altman, Atlantis?STS-125 astronauts are preparing to fly the fifth and final servicingmission to Hubble. During their planned11-day mission, the seven-astronaut crew is expected to perform fiveback-to-back spacewalks to replace gyroscopes, make unprecedented repairs andinstall new instruments to make the now 18-year-old space telescope morepowerful than ever. It shouldtake shuttle workers about two days to move Atlantis into NASA?s 52-story VehicleAssembly Building, hoist it into a vertical position and attach the orbiter toits external tank and rocket boosters, Thomas said. The shuttle is slated toroll out to its Pad 39A launch site sometime next week. Atlantis?STS-125 flight will mark NASA?s fourth shuttle mission of up to five planned forthis year. The upcoming spaceflight is also the only one of the space agency?s 10remaining shuttle missions not aimed at completing construction of the InternationalSpace Station before the orbiter fleet is retired in 2010.